My log-in doesn’t work anymore. Who can I contact for help or advice? Some of your listings have been taken. Why are they still being listed? 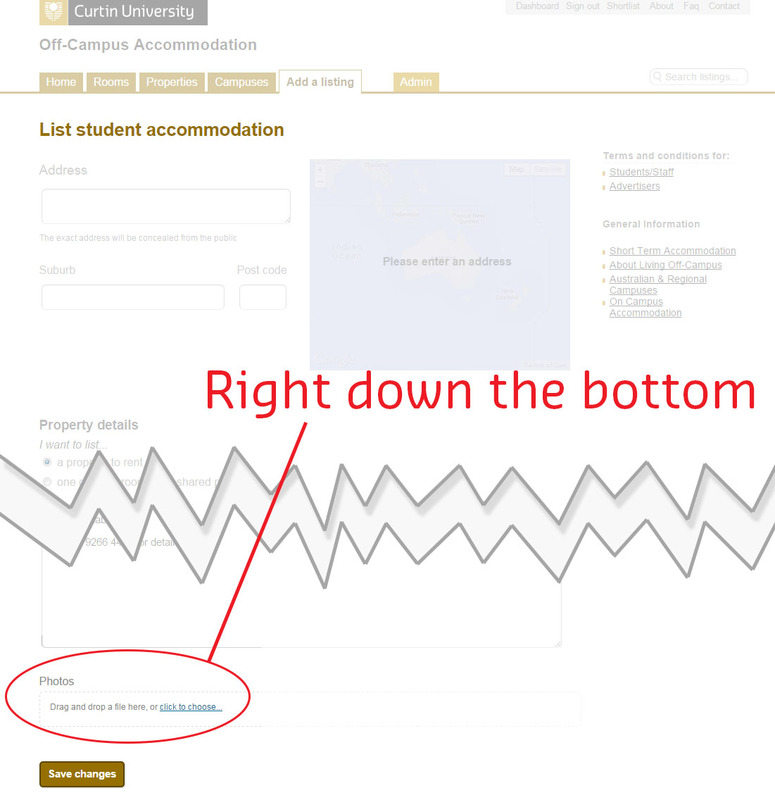 How do I apply for on-campus accommodation? 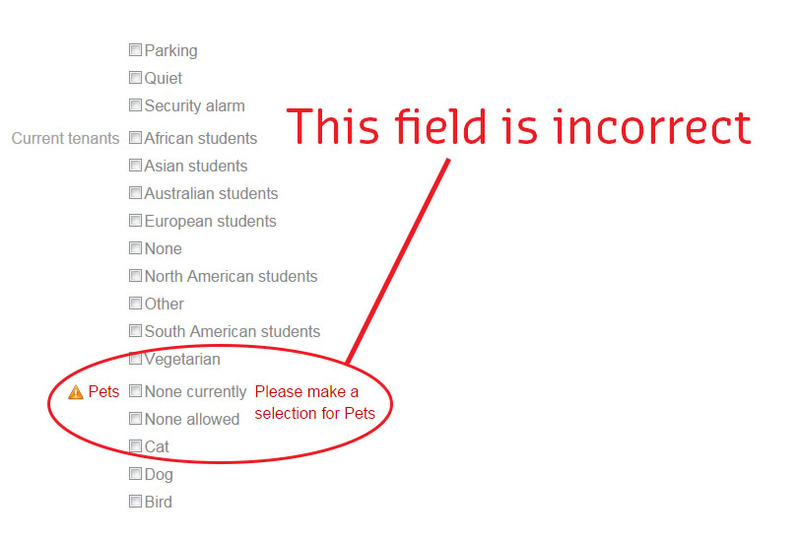 I keep getting a message that says "1 field is incorrect." How long until my advertisement is listed? How long does my listing stay active for? I have multiple rooms with different prices. How do I list them? How do I close my listing? How do I relist my property? On the log in page, click on the “Forgot your password?” link and enter the email address that you used to register. Further instructions will be emailed to you. We only grant access to our database for a period of one month, after which you can re-register. The Curtin Housing Advisory Service can help you with your listing, or give you advice on tenancy-related issues. 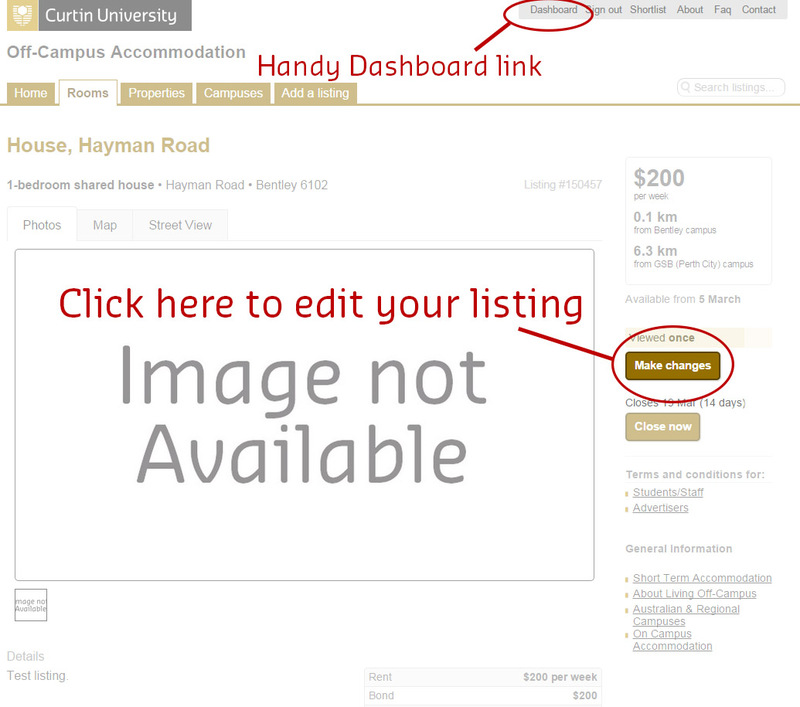 Contact us by email; housing@curtin.edu.au or phone; +61 08 9266 4430. Once you have registered, we will check to make sure that you are a current student/staff member. While we endeavour to do this as quickly as possible, please allow 1-2 days. Often, the problem is that a photo has not been added to the listing. The system requires that a photo be added to every listing that is submitted and it will not let you proceed until you have added one. We recommend that you only use internal shots of the property, to safeguard your privacy. 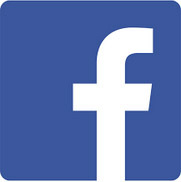 Please see the FAQ "How do I add photos?" for more details. 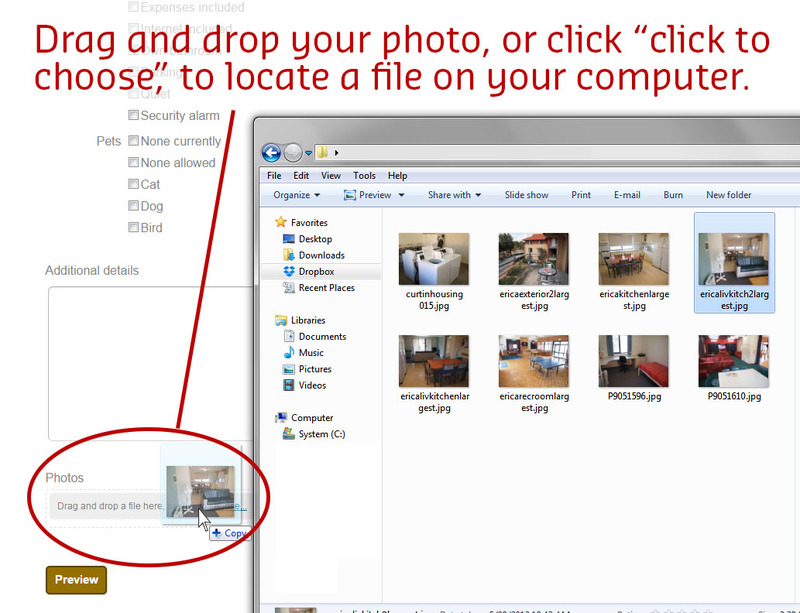 Either click the "click to choose" link to locate the photo you wish to use, or drag it into the box. Please note that the "click to choose link can sometimes be a little slow to load, so try to click it once, then give it a little time if nothing happens. Now you can continue with your listing. Once you have registered, we will check to make sure that your listing matches our requirements. While we endeavour to do this as quickly as possible, please allow 1-2 days. Two weeks, after which time you may re-activate it. You can list multiple rooms on one listing, but unfortunately there is only one field for the rooms' price. We recommend that you enter the price of the highest room in the "Rent" field, then put a breakdown of the prices in the "Additional details" field. After you sign in to the database, you should be automatically taken to your "Dashboard." This is the main page from which you can control your listings and account details. 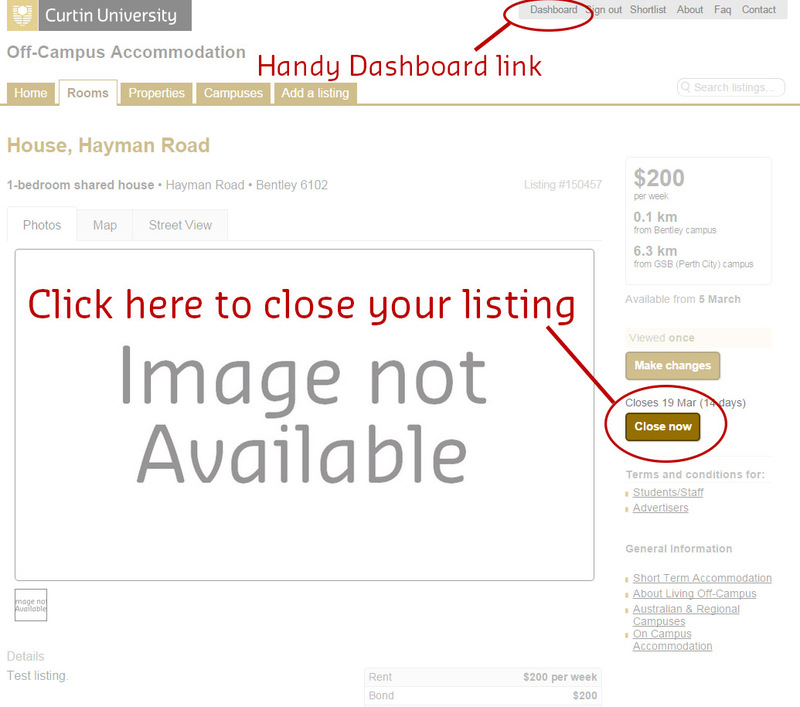 If you are signed in, but can't get back to the dashboard, there is a handy link at the top of every page, just to the right of the Curtin University logo. From your dashboard, click on the address of the listing you wish to change. This will display the details of the listing. From here, clicking on the "Make Changes" button will take you to a form where you can change the listing's details. From your dashboard, click on the address of the listing you wish close. This will display the details of the listing. From here, click on the "Close now" button. The database will hold on to your details so that you can re-list it, if it becomes available later. 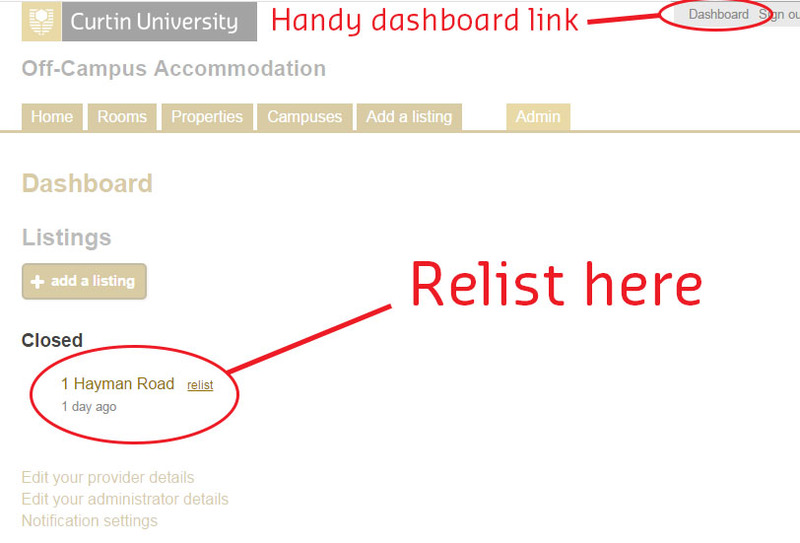 From your dashboard, click on the "relist" link, next to the address of the listing you wish relist. This will display the details of the listing. Once you have checked that all of the information is still current, click "Save changes," then "Submit this listing".